I've had this Trinidad single for quite a few years, but haven't been able to find anything on it. In an effort to clear out some of these neglected discs in my collection, I thought I would post it on here. 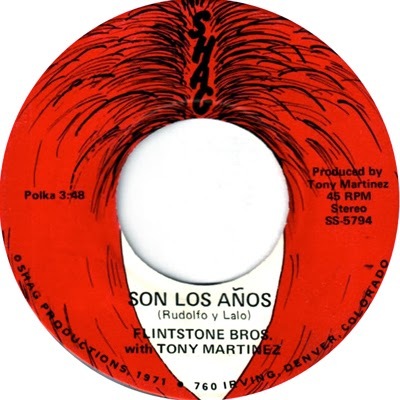 Nice Hispanic single by Tony Martinez. Lots of guesses on this one. Internet doesn't really help much. Band members are noted on the label, so that fills in a few holes. 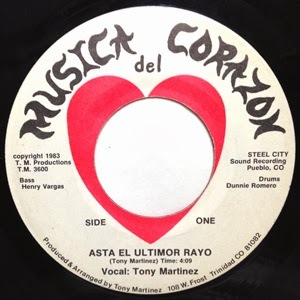 Found out that drummer Felipe "Dunnie" Orlando Romero, Sr. passed away in 2013. Bassist Henry "Hank" Vargas was later in the Rocky Ford-based group Chickens of Depression. Recorded at Steel City studios in Pueblo. 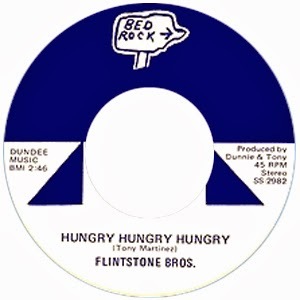 I'm pretty darn sure that the Tony Martinez on this record, is the same who appears on the Flintstone Brothers single "Hungry Hungry Hungry," recorded at Norman Petty studios (note the name "Dunnie" on the label), as well as the Shag label single, also noted below. If anyone has any additional information, or can provide audio of these two records, drop me a line.